The Insole is clean and odor free. The bottom soles show VERY slight and light wear. No signs of abuse. We bring the joy of quality and luxury at cheaper prices into your hands. With that they may have light scuffs, scratches, or soil from being tried on to being lightly worn. Spider Rubber Sole. Slip On with pull tabs at heel and tongue. Slight yellow discoloration on left shoe heel and right shoe toe. See close up pictures, ( last 2) I have pointed this out. TEVA Womens Original Universal Gradient Pink Black Ombre Sport Sandals US 7 NEW! Teva brought back the ORIGINAL from 30 years ago and it is still just as bad to the bone as it was back then. 100% Authentic Teva. Factory samples. Excellent condition. Worn once. Very clean. Suede accents. Contoured EVA foam midsole providing lightweight comfort and support. We do whatever it takes to ensure you have a positive experience - Consider us your partner in fashion! Our Durabrasion Rubber™ providing durable traction. TEVA Womens Original Universal Gradient Bright Pink Blue Sport Sandals US 7 NEW! Bungee Cord Closure. This item may show signs of minimal wear or minor creases from having been tried on, etc. The shoes may not be in the original box. Rubber Outsole. SKU: 43719. MSRP: 120.00 Our Price: 54.99. Model # : 1002873. SAMPLE Size US 7 M (B), Size EU 38, Size UK 5. - WE TAKE SEVERAL PICS OF EACH SHOE. WE HAVE LEARNED THAT PICTURES ARE THE BEST INDICATORS OF A SHOE'S CONDITION & NOT OUR WORDS. Color : Burgundy. We have a selection of new shoes. Those are rated using the shoe condition chart below. Athletic Shoes. Running & Athletic Shoes. & Casual Shoes. EXACT shoes pictured here. A minor flaw(s) may be included. TEVA Arrowood LUX Mid Calf Leather HIKING SHOES 1013645 Brand new without box. FREE 3 DAY SHIPPING! :) Size: 7 Color: Stargazer Blue Features: ---Full-grain waterproof hiking boot featuring front and back pull loops ---Shaft measures approximately 2" from arch ---Rubber sole ---PU removable sockliner ---Float-Lite midsole and outsole. 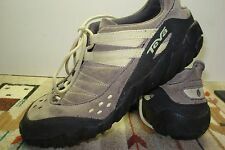 TEVA Womens Tevasphere Speed Trail Running Shoes Trainer Sneaker Sz 7 Black Pink Condition is Pre-owned. Shipped with USPS Priority Mail. Model # : 1006260. Teva Refugio Evo Trail Hiking Shoes. Color : Lunar Rock. SAMPLE Size US 7 M (B), Size EU 38, Size UK 5. We have a selection of new shoes. Those are rated using the shoe condition chart below. Shoes are in excellent condition, have never been worn. Lace Up Front Closure. Designed For Use Both In And Out Of The Water. 100% Authentic. Made In Vietnam. Insoles and inner lining are slightly dirty. Heels and toes show light dirt and scuffs. Length: 10". Sides show light dirt and scuffs. Insoles: 9.5". Width:3.5".